Scotland Yard and MI5 were not plugged in.It has caught them with their pants down. Tangled round their feet in fact. I have had a busy weekend, but am keeping up the pace. I am attaching in confidence two more chapters of Himmler. . .
We have alas lost one of my best editorial friends, Gerhard Röhringer, of Santa Barbara; he died on July 25 and he will be sorely missed. My own fault, for taking so long. But this is a job which needs doing properly. You will get a sense of ominous things lying ahead, like driving down a long summer highway and seeing a jet-black, lowering sky far ahead. Ah, a nice metaphor. I should be a writer. Oh, I am. OFF to Wiltshire. 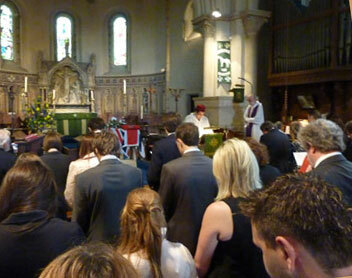 at 9:25 a.m with Jessica for John's funeral. ; at eleven we are at Melksham, and I pick up ten boxes of Hitler's War - hooray! - and speed on, arriving at Holy Trinity church at Dilton Marsh, at 12:10 pm. A family crowd had gathered on the pavement, awaiting the hearse. I chat with them for a while. I was, and am, puzzled at the total absence of any RAF delegation. John Gourier's widow is there, and she tells me later that sixty members of her husband's regiment attended his funeral. Perhaps it was an oversight, but John's son David Jr. in one of the three moving and well-prepared eulogies delivered by the children, mentions that his father left the RAF "under a cloud" after they adapted his work on the airfield busting bomb, the Paveway I believe, to develop scatter-bombs, which he had considered criminal and refused to work on. He left to join the Sultan of Oman and build up the airforce there, and became a Muslim. The service here is partly Muslim in consequence, which I find strange. Abdullah is there in priestly garb, and an imam, much older, and the English vicar took it all in good part. I said to him at the reception afterwards that John was like that, and had pronounced views on everything. He had taken out double insurance, so to speak. "Probably right about now he is discovering which one will actually pay up." Discreet chuckles. After we follow the coffin into the church, I discover to my astonishment that it is packed to the eaves, with perhaps three hundred people crowding the pews. He was a man with many friends and admirers. Pews for the family have been reserved in front, and we lustily sing the hymns which were John's favourites. None of his children mentions his passion for musical instruments, though David does refer to the fact that his house listened only to Classical music. "Sound familiar?" It is a happy, joyous celebration of an eighty-one year life. 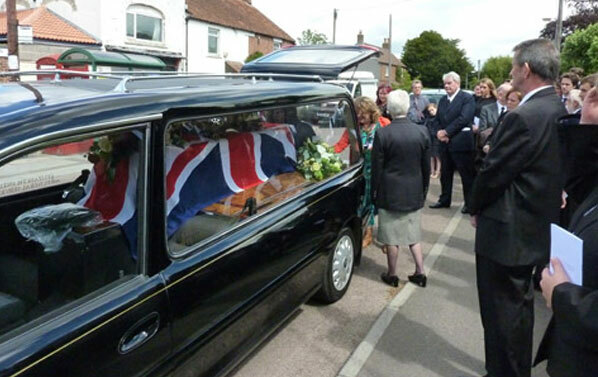 As the coffin is carried past by the pallbearers, I put my hand briefly on the Union flag that drapes it and silently say Goodbye again, and I proudly slip in to the exit procession right behind Alison and her son as she leads us out to the sunshine. AS we wait for the hearse to be readied and the flowers to be laid on top, I remind one of the sons, David, who made all the preparations for today with John over many weeks, that his father had required all four children to act as pallbearers of their mother's coffin. He explains, "Health & Safety. John wanted that here too, but government regulations say that pallbearers now have to attend a course of instruction." Ridiculous. A lovely morning. Nicky and Carol are there - the former looking healthier than I had expected. I walk over to Carol with Nicky and ask Jessica to take a picture of the three of us, but Carol makes an excuse and says crossly: "Not now." Cross: She always was that. Jessica is much admired in her black silk dress, which is far too short for a funeral; but she is well covered at the top, while elsewhere there is much flesh on display. Back to London at eighty miles an hour most of the way, after a brief visit to the warehouse on the way. 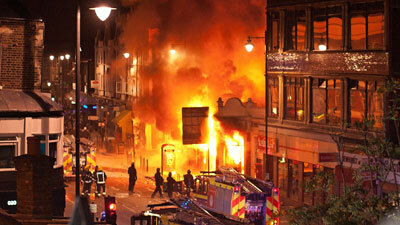 Television news is crowded with images of the Black rioting and looting across London, as buildings are set on fire. The police seem reluctant to intervene, for fear of being accused again of "institutional racism." A police delegation has now apologised to the gunman's family, revealed as a known member of a Broadlands Estate gang, for shooting him. Poor England. John is well out of it. Somebody has emailed me: "You might want to put on Facebook this discussion of the coming Himmler book." Jaenelle has sent me a link to a Blog about my website: It talks of "
leading me to a garish, dated website ." Jaenelle is unrelenting: "I do have to agree with the assessments of the website, unfortunately. It is extremely outdated and unattractive. 1994 has long since passed. 1994 is the era your website tends to evoke in a person's mind." "You weren't even born then," I tease her. "I had only just obtained my first Mac computer, with one MB of RAM and a hard drive capable of holding 40 MB." RADIO and television at ten a.m. announce that the rioting, burning and looting have spread all over London, with over four hundred arrests and every prison cell in the capital now filled. Hundreds of Blacks are now homeless, their family homes burned down by people of similar colour. I can't remember this kind of thing happening under Hitler and the Nazis. Or in the DDR. Ah, the creature-comfort loving democracies! Where is the piano-wire when you need it! London mayor Boris Johnson and our benighted (literally: overtaken by the night) prime minister David Cameron have now finally returned from their overseas holidays. (Fine patriotic Britons they are). Jessica spent last night with her best friend, Boris's niece. I ask her to tell mum, Rachel Johnson, that her brother Boris has committed one of the biggest P.R. blunders of his career. Showboating in fluffy bleach-blond hair does not always cut the mustard, Boris. The King Canute act will hurt Boris and Cameron badly. Or do I mean King Alfred? The media are avoiding the word "race," and some people even point out to me that there are Whites in the mobs. Yes, the outer fringe of the Bell Curve, where the thickest Whites marginally overlap with the cleverest Blacks -- and not a few of both populate our media: the ignorant criminal element will always join in. Our Old-Etonian Government seems powerless. The use of Twitter and Blackberry Messages has replaced the old-style mobile-phone flash mobs of just two years ago. Scotland Yard and MI5 were not plugged in. It has caught them with their pants down. Tangled round their feet in fact, and they will find they can't run far like, that if and when the real violence begins. My own suspicion is that police Intelligence is way behind the curve, and that what has happened these last three nights has been long prepared by our multi-cultured guests. : Joseph's Coat of Many Cultures turns out to be an Eton-schoolboy psychedelic dream. The emperor has no coat at all. At eleven a.m., there is a BBC News special bulletin. Throughout the forty-five minute program the non-Englishness of the majority of the rioters and looters filmed by their cameras is not mentioned. The newsreader is Black, of the cleverer, well-spoken kind. The prime minister speaks -- a vacuous text laden with clichés and words like huge, incredible, and even that Tony Blair standby, "unacceptable." Behind him, a Black policeman stands guard on No. 10, Downing Street. Pure coincidence, of course. Does the BBC imagine that its viewers are really that stupid?.